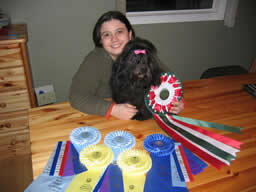 Cailleach, my little Havanese puppy girl sure showed her little heart out at the Crocus Obedience and Kennel Club Show this weekend. Here are her results for this weekend. From what I understood, Cailleach got a four-point-major during the Sunday show. She now has nine points and is one point away from being a Canadian champion. Way to go my sweet little girl! I cannot waite to hear her side of the story!